The Malabar Nut is a small evergreen bush originally from the lower Himalayas. It has oppositely arranged, smooth-edged, broad, lance-shaped leaves borne on short petioles. They become greenish-brown when dried, smell similar to strong tea and have a bitter taste. It bears flowers with large, attractive white petals, streaked with purple on the lower lips. Need well drained soil in full sun. Make a good container plant. Leaves, roots, flowers and stem bark. Adhatoda vasica leaves have been used in Ayurvedic Medicine for over 2000 years to treat respiratory disorders. 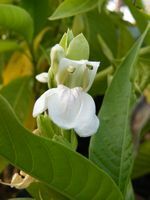 The leaves contain carotene, vitamin C and essential oil - the whole plant is sedative, expectorant, antispasmodic, antiseptic, expectorant, anthelmintic and blood-purifying. Adhatoda vasica is useful in treating bronchitis, colds, whooping cough, asthma, tuberculosis, sore throat and other lung and bronchial disorders. In southern India the powdered leaves are used to treat malaria. A juice made from the leaves can be used to treat diarrhea, dysentery and to control both internal and external bleeding such as peptic ulcers, hemorrhoids and bleeding gums. The whole plant is useful in the removal of intestinal parasites - take a decoction of the root and bark/ or take the juice from the leaves and drink a teaspoon three times a day for 3 days. A poultice made from the leaves is applied to wounds, rheumatic joints and edema. A warm tea of the leaves is useful in treating scabies and other skin diseases. The boiled leaf gives a durable yellow color to dye coarse cloth and animal skins. The leaves can be applied as green manure - it contains potassium nitrate. The leaves contain the alkaloid vasicine, which is toxic to cold blooded animals (including fish) but not to mammals. The leaves are used in packing and storing fruit as it help immature fruits to hasten the process of ripening - it also inhibit fungi and repel insects from stored fruits. 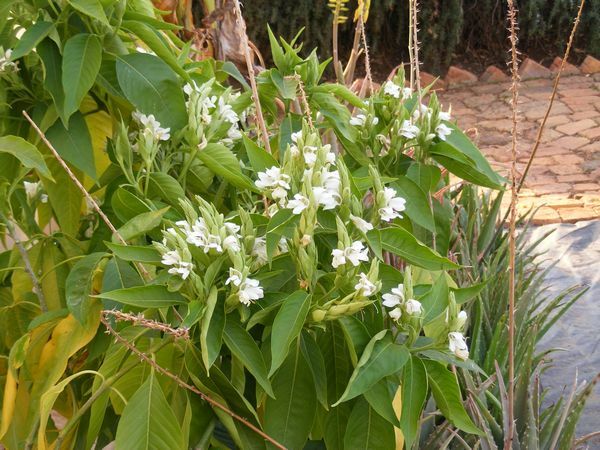 An infusion of the leaves can be used for destroying termites, flies, mosquitoes and other noxious insects. The leaves inhibit and check the development of parasitic vegetation on neighboring plants. 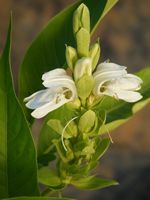 A decoction of Adhatoda vasica bark, leaves, and flower can be used to eradicate living red spider mites and eggs.